Come see us in the Big Easy! 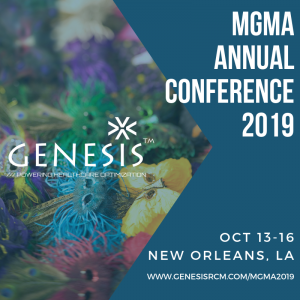 Genesis RCM will be attending the MGMA’s 2019 Annual Conference Conference in New Orleans, to share in the discussions about ALL of the hottest revenue cycle, business process and care delivery challenges that health systems and providers are tackling this year to strengthen their operations and drive growth. GENESIS RCM is a leading nationwide provider of outsourced healthcare revenue cycle and payment solutions, partnering with hospital networks, physician practices and surgery centers to optimize operational efficiencies and maximize revenues – keeping them squarely in the control of their business. Physicians across the country rely on Genesis’ knowledgeable employees, unchallenged technical expertise, and rich medical billing experience to manage nearly $350 million in annual billings across three dozen medical specialties. Let us know you’re going to be there, and we’ll share a coffee or a drink – on us!